Each RSCJ community in this province has a copy of the 'book of life', in which are listed - day by day - all our members who have died since the province began in 1842. The book is a great leveller: superiors are listed alongside cooks; missionaries alongside those who never left our shores. Great and illustrious 'names' are not afforded any special treatment: their names and bare facts are recorded in exactly the same font and manner as everyone else's; all that matters is that these women, whatever they did or achieved, lived and died within the Society. ... Except that not every RSCJ can say the centenary of her death has been celebrated with conferences, liturgies, books, articles, reflections and worldwide interest and research spanning more than a year! Very few, apart from our two canonised saints, have received quite so much attention. What was so special about Janet Stuart? After all, she wasn't a pioneer or an inventor; she didn't write any great novels or lead any successful campaigns. She spent most of her life in a country vicarage or a convent, far away from places of power and great discoveries. 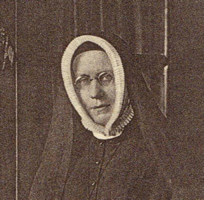 She was only famous within the Society of the Sacred Heart and its schools, and this wasn't for being a founder like Sophie Barat or an intrepid missionary like Philippine Duchesne. And this was my answer, and the simple challenge and inspiration arising from it. So why do we celebrate her life? Maybe it's because she was simply herself, Janet Erskine Stuart, a wise and gifted woman, who lived her life and used her gifts as fully as possible: a woman who lived an ordinary life in an extraordinary way and made an impact on those who met her. And perhaps as we get to know her we too can be inspired to live our lives and use our gifts as fully as possible, and make our own impact on those we meet. One of us... though extraordinarily so... And this, really, is who and what we have been celebrating and will continue to celebrate in more low-key ways: an older sister whose writings and example continue to inspire us, a century after her death. May she pray for us as we too seek to grow and live our lives with all the fullness to which God has called us.